At the invitations of President Sauli Niinistö of the Republic of Finland and President Donald Trump of the United States of America, Chinese President Xi Jinping will pay a state visit to Finland from April 4 to 6, and will meet with President Trump in Mar-a-lago, Florida, from April 6 to 7. 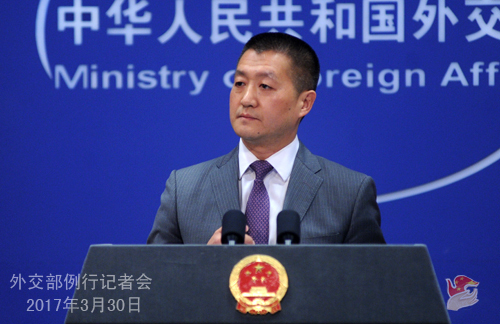 The foreign ministry will hold a press briefing for Chinese and foreign media at Lanting at 8:30am of Friday, March 31. Leading officials of the foreign ministry will provide information on President Xi's state visit to Finland and the meeting between the Presidents of China and the US in Florida and take questions from the press. You are most welcome to attend the briefing. Q: It's been a long time since the last visit by China's head of state to Finland. What are the most important reason and expectation for President Xi's visit to Finland at such a moment this year? A: Finland was one of the first Western countries to establish diplomatic ties with China and the first Western country to sign an intergovernmental trade agreement with China. In recent years, Sino-Finnish relations have enjoyed a good growth momentum with frequent high-level exchanges and stronger political trust. Finnish leaders have invited President Xi to visit Finland for several times. The specific arrangements of this visit were determined by the two sides together. This will be President Xi's first visit to a EU member state this year and his first visit to Northern Europe as the Head of State of China. It shows the importance China places on building and advancing the Future-oriented New Type Cooperative Partnership with Finland and China's support to the EU. We hope this visit will be fruitful, inject new impetus into the growth of bilateral relations, and further enhance political trust and practical cooperation between the two sides. Senior foreign ministry officials will provide more details of President Xi's visit to Finland at tomorrow morning's press briefing. Q: It is reported that economic and trade issues would be one of the major topics for next week's meeting between the Chinese and US Presidents. The US has recently criticized China for unfair trade practices that has harmed US economic interests. Do you think the upcoming meeting between President Xi and President Trump will redefine the future economic and trade relations between the two countries? 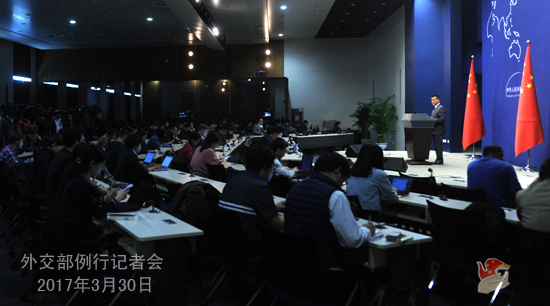 A: Senior foreign ministry officials will talk in detail about the upcoming meeting between the Presidents of China and the US at tomorrow morning's press briefing. You mentioned the economic and trade relations between China and the US. We have stated many times that these relations are, in nature, mutually beneficial. Over the past 38 years after the establishment of diplomatic ties between China and the US, the two countries' economic and trade relations have grown exponentially, bringing tangible benefits to the business circles and consumers. According to statistics, in 2016, total volume of China-US trade in goods reached US$519.6 billion, which is 207 times higher than the figure at the establishment of diplomatic relations in 1979. China is now the fastest growing export market for the US other than North America. The US often talks about the so-called trade imbalance issue between the two countries, but in fact, around 40% of China's surplus in its trade with the US is created by American companies operating in China. Like I said not long ago, according to statistics from the US-China Business Council, two-way trade and investment between the US and China created about 2.6 million American jobs in 2015 and the two countries' economic and trade relations helps every American family save US$850 each year. Of course, to be objective, China has also benefited a great deal from economic and trade cooperation between the two countries. Actually, the enormous progress China has achieved after starting reform and opening up is attributable to its cooperation with the US and other countries of the international community. Practice has proven that growing our economic and trade relations can realize the strong complementarity between us and market choices have led us to the state in which we both have a stake in each other's success. We believe that the fundamental and viable way to allow our economic and trade relations to better benefit the two peoples is to work together and enlarge the pie of common interests, rather than merely sticking to the argument that which side has taken a bigger share. We are willing to work with the US to expand areas of cooperation and to properly handle economic and trade frictions through dialogue and communication on the basis of mutual respect and win-win cooperation, so as to ensure the healthy and steady growth of Sino-US economic and trade ties. Q: Given the facts that the UK has just officially triggered the Brexit process and France and Germany will hold elections this year, what signal will President Xi's visit to Finland send to the EU? A: Not long ago, the EU celebrated the 60th anniversary of the Treaty of Rome, making their voice of unity heard for the advancement of the integration process. Given the fluid international situation, the dynamics in Europe, an important player in the world, have a significant influence on the global landscape. China has been highly attentive to the developments in Europe. We support the European integration and hope to see the EU remain united, stable, prosperous and open. China and the EU are comprehensive strategic partners. We are willing to join hands with the EU to strengthen mutually beneficial cooperation and advance China-EU partnerships for peace, growth, reform and progress of civilizations, so that we can take China-EU relations to new heights and promote peace, stability and prosperity of the world. Q: A US State Department employee has been accused of taking gifts from Chinese intelligence officials in exchange for information. What is your comment? A: I am not aware of any relevant information. Q: China beat Japan in the bid for Jakarta-Bandung high-speed railway in 2015. But Kyodo News reported that although construction has started, the project is only moving forward very slowly, raising questions about whether the construction can be finished as scheduled by the end of 2019, and that Indonesia has growing mistrust for China. What is your response? A: We noticed relevant reports of Kyodo News. Jakarta-Bandung high-speed railway is the first overseas high-speed railway system project that uses Chinese technology, standards and equipment. It is a major early harvest of the Belt and Road Initiative. Once completed, the railway would become the first high-speed railway in Indonesia and even Southeast Asia. According to our knowledge, preparatory work for the construction of all sections of the railway is moving forward as scheduled thanks to collective efforts of the governments of China and Indonesia as well as relevant companies. Jakarta-Bandung high-speed railway is a huge systematic project. Its procedures, from contract negotiations, compliance study, route design, land acquisition, field survey and construction preparation to construction of all sections, completion and operation, all take some time. And issues of one kind or another might emerge in this process. Since construction of the leading section of the railway began last year, the Chinese and Indonesian sides have been working very closely to push forward all relevant work of the project with their best effort. The two sides are currently having consultations on the Engineering Procurement Construction (EPC) contract and the loan agreement. As far as we know, the two sides will hopefully sign these agreements in the near future. I would like to stress that Jakarta-Bandung high-speed railway is a landmark project of China-Indonesia all-round practical cooperation. It benefits both sides and is carried out by them together. The two sides are determined to cooperate and the companies and financial institutions of the two countries are close partners. To conclude, I want to add one point. China is fully confident in the early completion of construction and operation of the railway. When it comes to assessing this project, it is better to hear the words from the participants of the project, namely China and Indonesia. Q: A Philippine lawmaker has asked for an impeachment of Philippine President Duterte on March 30, criticizing his policies towards China's activities in the South China Sea. Do you have any comment? A: I noticed the report just a short time ago. I would like to point out that for most of the time after the establishment of diplomatic ties, China and the Philippines have properly managed their disputes over the South China Sea through bilateral dialogue and consultation. This experience is important for maintaining stable growth of bilateral relations and such successful practice can be sustained. During President Duterte's visit to China last October, the two heads of state reached the important consensus to properly handle the South China Sea issue, taking the two sides back to the right track of properly handling the South China Sea issue through dialogue and consultation. This is a right choice as it serves the fundamental interests of the two countries and peoples. 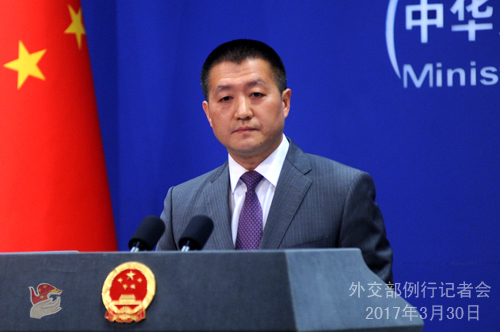 The two sides are now actively engaged in dialogue and cooperation on the South China Sea issue and the situation in the South China Sea has stabilized and improved. Such progress is widely applauded by regional countries like the Philippines and the vast majority of the international community. Q: Who will be giving the press briefing tomorrow? 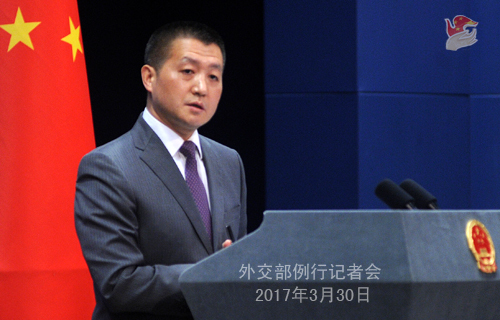 A: Based on the information I have, it will be Vice Foreign Minister Mr. Wang Chao and Vice Foreign Minister Mr. Zheng Zeguang. Q: The company owned by Kushner, the son-in-law of President Trump, has announced the end of negotiation with China Anbang Group for real estate business in New York because of the criticism from the US Congress. Do you have a comment? A: I am not aware of this. In principle, we do not comment on business exchanges and transactions.